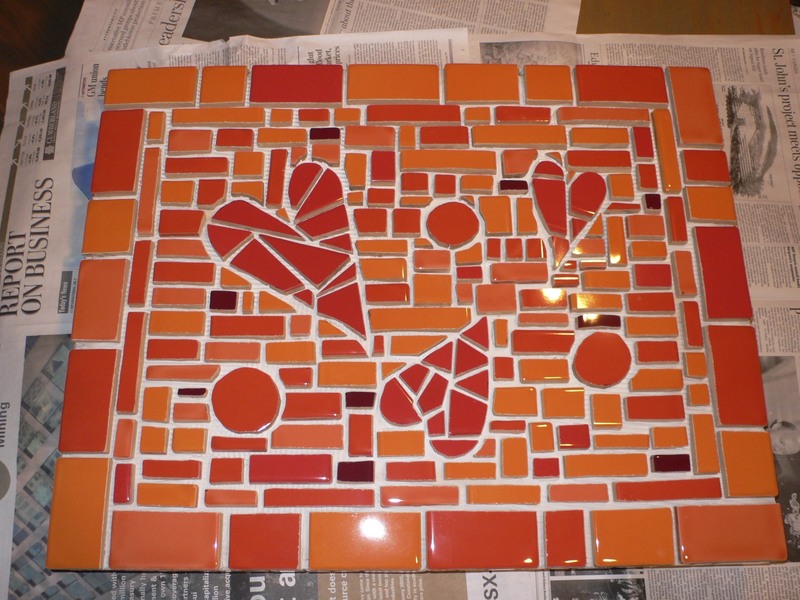 In years past when I was busy doing tile mosaics, I created 3 pieces for charity events. Two were for fund-raisers for the Alberta Children’s Hospital, and one was for a school that my children attended, Calgary Academy. I tiled the tops of two kitchen carts. These were Ikea carts that came with butcher block tops. The tops were replaced with new wooden tops that were slightly smaller so that when the tile was applied, the proportion would still be correct. 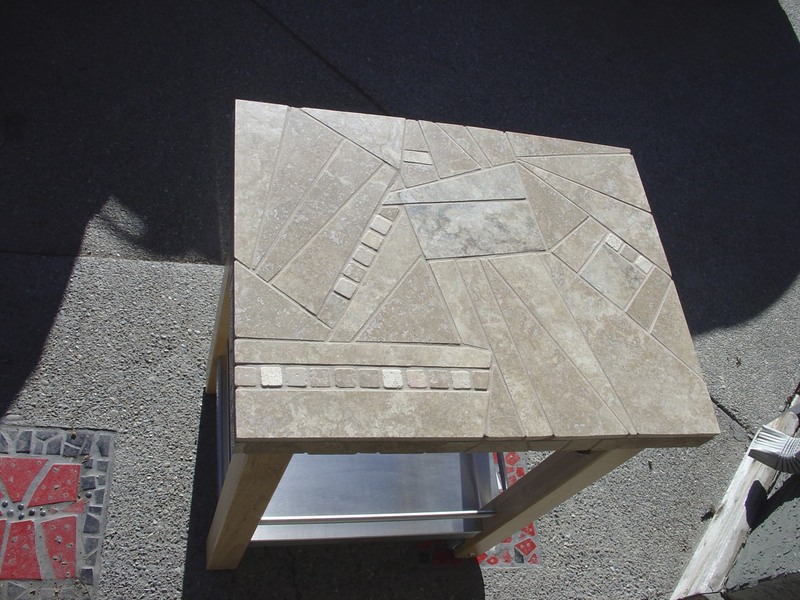 The first piece was done in limestone which I cut and pieced like a puzzle. The stone was donated and it was a challenge for me to work with such subtle color. I’m not really know for “subtle”. The red, black and white tiles visible on the ground are mosaic inserts in our driveway. The second cart was much easier for me. The theme that year was “From the Heart” so I could work in colors that I love. These tiles were leftovers from my daughter’s kitchen renovation in Montreal. Now there’s a project to share another day. See how different the tile looks once the grout is in place. 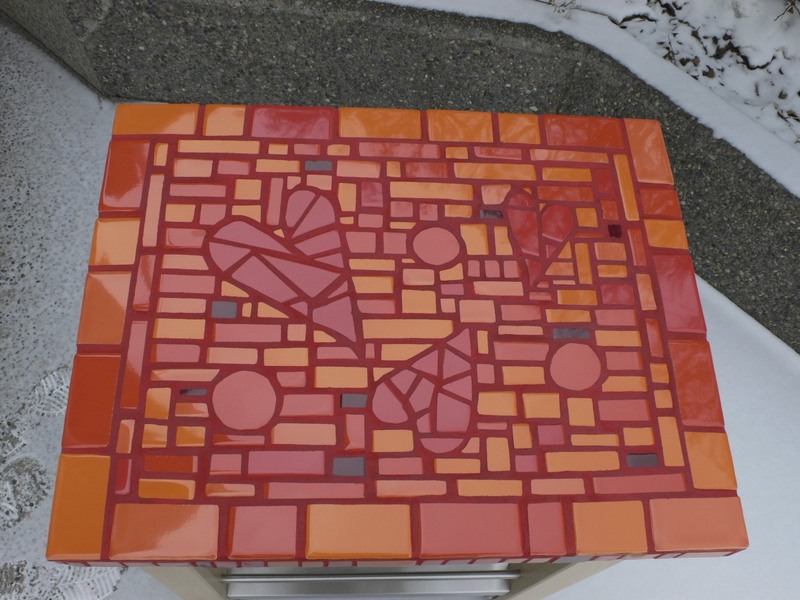 The other fund-raiser piece was a large table trivet. 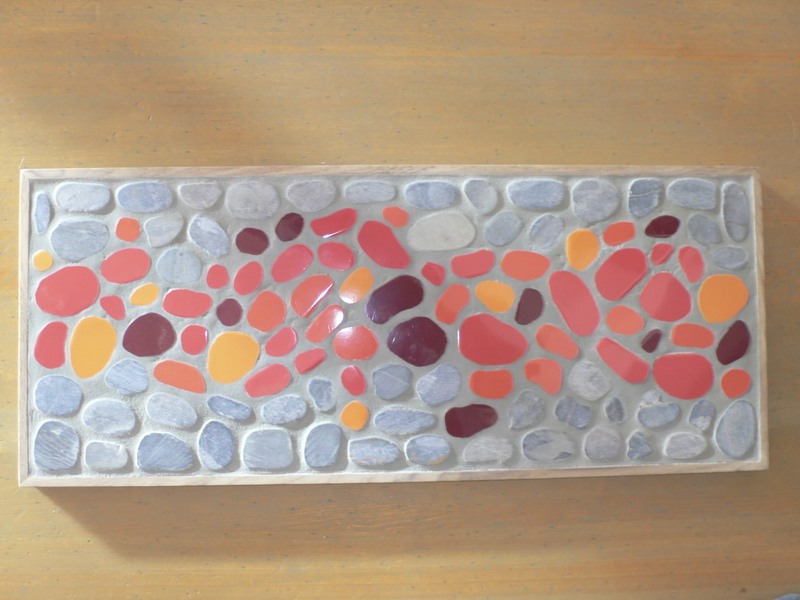 For this piece I cut all the tiles in shapes to mimic the sliced river stones that I used. 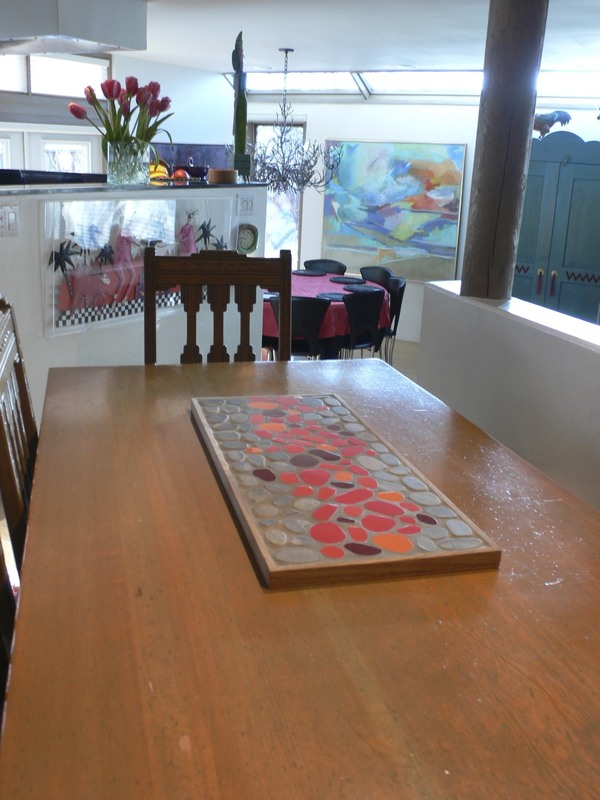 The wooden frame was made of teak so that the trivet could be used outdoors. These projects were fun to do, especially knowing they would help raise money for good causes. I’m hoping to get back to some tile work this summer. I’m sure my hands will have recovered from their surgeries sufficiently so that I can handle the tiles, saws, sanders, grout, etc. etc. etc. I really hope so! Thank you. The tiles in the driveway were added when we widened the drive. We pressed wooden forms into the concrete to make room for the tiles and I added them after the concrete was set. They add a little hit of color that most people don’t even notice, but I know it’s there! The one handed thing is a real drag. Today I was cleaning snow and ice off of Bob’s car to get him out the door. At least I found mittens that would fit over my splint! Can’t wait to collaborate on your backsplash. 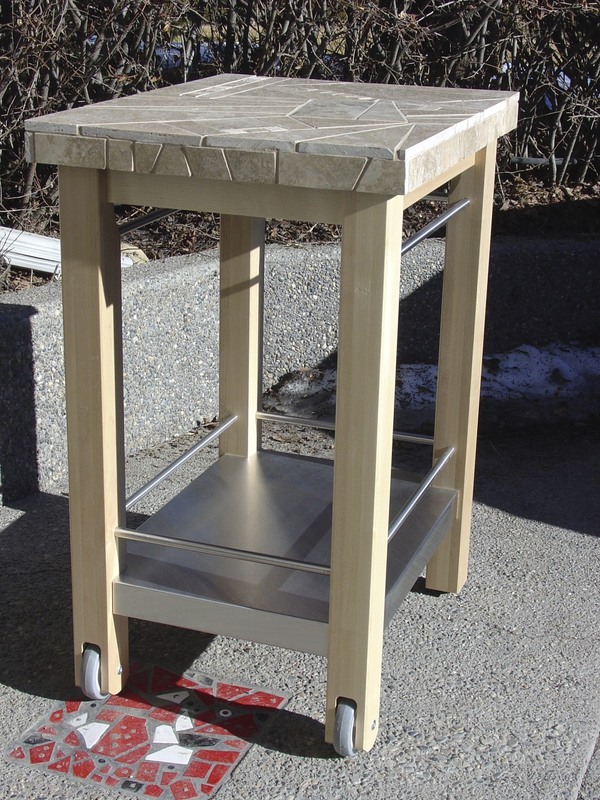 great projects Terri – won’t be long now that you are back at the wet-saw and sanding edges of tiles. I am certain whoever purchased these pieces are still enjoying them today. Great!